The Great Heir repaid his purchase price several times over when scooping the £147,500 first prize for the two year-old stakes. Picked up for 33,000 euro at Arqana Sales in France in August 2017, the son of Pedro The Great justified the faith of trainer Kevin Ryan and owner Dave Stone with a narrow victory, as outsiders dominated the finish. Driven to the line by Andrew Mullen, The Great Heir got the verdict by half a length from Dirty Rascal with Wasntexpectingthat three-quarters of a length away in third place. A delighted Stone said: “We were eighth last year with a horse we bought at Arqana, like this guy, and it was the first time Andrew has ridden him competitively. “It’s his third win. He won at York for me – that was my dream and this is something else. Ryan said: “We had three nice horses in the race. This horse is tough and consistent. I knew all three were coming into the race well. We didn’t know how their draws would work out, but we knew they were all in good shape. “When you’ve got three horses healthy and well you know you’ve got a chance. Weatherbys has been sponsoring races in the UK for over 30 years. They also sponsor races and support events in Ireland and France. 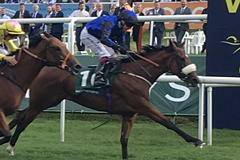 In 2012 Weatherbys put their name to over 100 individual races in the UK.